I’ve rarely had a test bike that split opinion quite so much as Yamaha’s Niken. 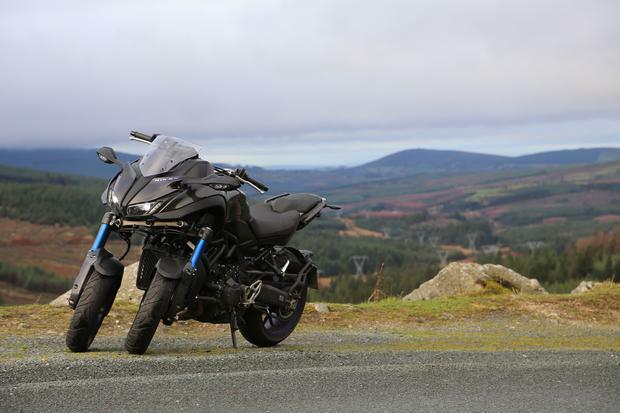 During the course of a Sunday blast a few weekends ago, the three-wheeled naked machine provoked every kind of reaction imaginable, from revulsion to delight and everything in between. One fellow biker even went as far as to say it would be a great bike for the sister-in-law, whatever he meant by that. One thing’s for sure – it’s a real head-turner. A wide front fairing combined with that unfamiliar dual 15-inch front wheel set-up all gives the Niken an aggressive, if unconventional, road presence. But a quick 360 of this machine and you realise that everything apart from the front end is very much familiar motorbike territory. Shifting up through the gears, you approach the first corner with a feeling of trepidation as you question whether this oddity will in fact deliver you out of the corner unscathed. You lean in, grit your teeth a little and then…. well, it’s business as usual, so much so that you have to remind yourself you’ve got two wheels up front. By the time you’re negotiating corners five, six and seven, it’s dawning on you that Yamaha’s leaning multi-wheel system (LMW) is not only keeping things familiar, it’s also giving you a hell of a lot more confidence in the front end. An Ackermann dual-axle steering system is at play here, with a cantilevered suspension system mounted to the outside of the wheels. The Niken will manage a 45-degree lean angle – more than most bikers need – before things get hairy. 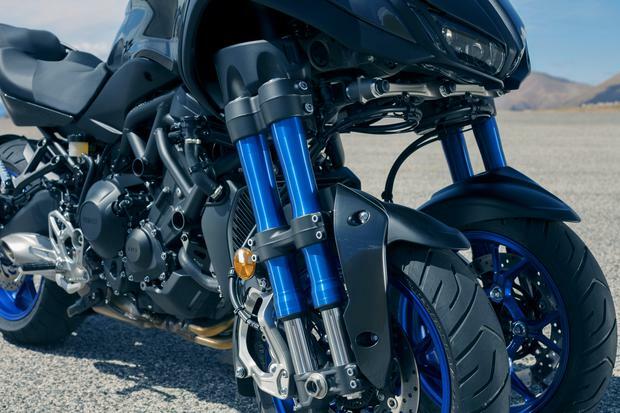 Yamaha has taken and tweaked the engine from the hugely successful Tracer 900, MT-09 and XSR900 machines. It’s a lovely 847cc triple producing 115hp and 87.5Nm. And the Niken doesn’t feel particularly laboured when you gas it, despite the extra weight from those two front wheels, dual shocks and two sets of front breaks. The screen is minimal but a slight dip of the head on the motorway, even with my 6.3” frame, kept the worst of the wind-blast at bay. Yamaha says the weight distribution is 50-50 but I found the bike a little unwieldy at slow speeds around town at first. You soon get used to this though, and once you’ve adapted your riding style urban trips are a doddle – once you remember the extra width of the bike thanks to the front set-up. Because the front wheels are only 15-inch, Yamaha has only managed 265.5mm discs. So when you do grab a handful, the Niken won’t stop as fiercely as other modern machines will. But it’s no deal-breaker – you’ll still scrub off enough speed to cover the vast majority of situations. Engaging the rear, 298mm, disc helps here. Standard spec is impressive, with ABS, a slipper clutch, cruise control, three riding modes and YCC-T, traction control with two modes and a 12V power outlet. 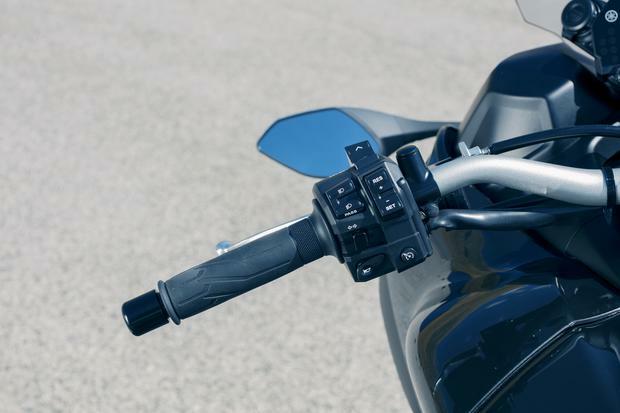 Yamaha announced last week that there will be a GT version available in 2019, with a higher screen, a comfort seat, 25-litre semi-soft side cases, passenger grips, heated rider grips and an additional 12v outlet. There’s no news on a price for the GT as yet, but expect in the region of €1,000 over the €16,800 price tag on the standard model. The Niken’s not going to be everyone’s cup of tea, but I’d challenge anyone who’s curious and in the market for a capable, confidence-inspiring machine that can do city commutes, weekend spins and even a track day to call Megabikes in Dublin (01-4784200) and enquire about a test ride, subject to the usual terms and conditions.